Boys of all ages love playing in the dirt, and some girls to too, and this personalized boys ornament captures the fun they have with toys or the real machines. 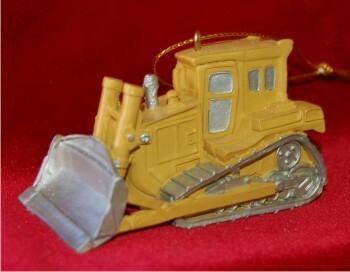 The bulldozer with realistic detail personalized ornament will put a smile on the face of anyone who loves dirt work. It’s a personalized kids ornament that includes lettering done by hand in a stylish font to create an excavating ornament that is one of a kind. Capture the fun this season with the bulldozer Christmas ornament personalized to be an instant hit with someone special.